If you take a good look at the living conditions of the average American turkey, chances are you'll want to grab your Thanksgiving bird and give it a good scrubbing before you throw it in the oven or fryer. Don't do it. Yes, turkeys can carry really nasty pathogens like Salmonella and Campylobacter. But washing the bird in the sink won't get rid of the germs, it will just spread them around so that you, the sink and everything else within three feet or so will be infested with deadly pathogens. You're going to cook the bird, after all. That will kill the germs, assuming of course that you cook it thoroughly and use a thermometer to be sure you heat it to 165 degrees in the innermost part of the thigh, the innermost part of the wing, and the thickest part of the breast. Don't just rely on the little pop-up thing -- use a meat thermometer. If you're frying the turkey, be sure to check out the exploding turkey warning from the American Chemical Society. Thanksgiving is not only a day for overeating but also the busiest day of the year for house fires. Defrost your frozen turkey safely. There are three safe ways to defrost a turkey: in the refrigerator, in cold water, and in the microwave oven. Thawing food in the refrigerator is the safest method because the turkey will defrost at a consistent, safe temperature. 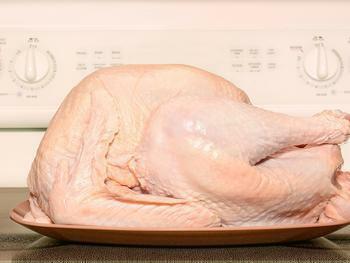 It will take 24 hours for every 5 pounds of weight for a turkey to thaw in the refrigerator. To thaw in cold water, submerge the bird in its original wrapper in cold tap water, changing the water every 30 minutes.Keep it in its wrapper to avoid spreading germs around your kitchen. Don't store food outside, even if it's cold. Storing food outside is not food safe for two reasons. The first is obvious -- animals can gnaw on it or even carry it off. The second is temperature variation. Just like your car gets warm in the summer, a plastic food storage container in the sun can heat up and climb into the danger zone (above 40°F). If your refrigerator is hopelessly full, use a cooler with ice to store the spillover. Easy on the leftovers. Leftovers are good in the refrigerator for up to four days. Cut the turkey off the bone and refrigerate it as soon as you can, within two hours of the turkey coming out of the oven. Leftovers will last for four days in the refrigerator, so if you know you won't use them right away, pack them into freezer bags or airtight containers and freeze.